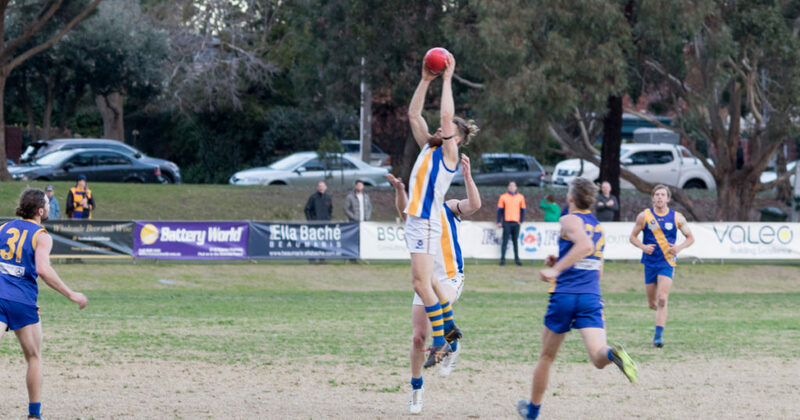 We anticipated a tough game against a Beaumaris side who, despite being yet to register a win, had shown impressive recent form in running Old Xavs to nine points, drawing with St Bedes and going down to Uni Blacks by three points despite kicking 20 goals for the game. We had two inclusions from last week with Joe Black making a most welcome return after rupturing his ACL early last year. Talented youngster Michael Greichen also came in for his second senior appearance. In the first quarter we had 17 inside 50’s for one solitary goal. We were a bit rushed in our desire to move it quickly and lacked quality with our disposals. By the end, we led 1.2.8 to 1.1.7. In the second term we got our act together and capitalised on our entries, kicking six goals to three to take a 17 point lead at the main break. The message at half time was to better use the ample space available on one of the league’s biggest grounds and a few of our lads needed to step up their contribution. We must give credit to our opponent, who totally outplayed us in the in the third quarter. They were fierce in their attack on the ball and gave us little room, kicking 5.3 to our 2.2 and regaining the lead 9.7.61 to our 9.5.59. With a vocal home crowd behind them, we had a real challenge on our hands. Our lads stepped up their intensity with all of our leaders showing the way. In particular Sam Williams, Tom Humphrey & Matt Fieldsend were super. We kicked 7.3 to 1.2 to win by 35 points. Jason Tutt was outstanding from start to finish and kicked two, Ben Nethersole continues to improve every week and Liam Wood (three goals) played his best game for the year. We meet last year’s premiers Old Xavs next week at home in arguably our biggest test for the year. Go Dees! However, our boys had a real crack. With Beauy third on the ladder it was always going to be a tough ask. At quarter time they led 5.3 to 2 straight with four of their goals coming from poor turnovers. We kept them goalless in the second, a great effort by our backline led by evergreen Tyson Parker with great support from Pat Burnell and Dan Anastasiou. Our back six worked hard all day. At three quarter time Beauy lead 7.11 to De La 3.4. We needed to kick the first goal in the last quarter to get some confidence into the boys. The first five minutes the ball was in our forward line but we just couldn’t get that goal. Callum Dooley played his best game, Ryan McDonough rucked all day and Nick Taylor gave his all. Again we finished with no rotations on the bench for the last quarter and a half. Simply, our boys ran out of legs and we went down by 35 points. For us, we need to stay focused for longer and clean up our ball use. We had enough ball but too many turnovers hurt us. Looking forward to taking a big scalp next week. Taking on the ladder leaders Beaumaris was always going to be a tough challenge. We were looking forward to responding from a disappointing week last week with four quarters of great effort. Beauy got the jump on us early. Their ball movement was good and they were able to get it into the big forwards one on one quickly. They were controlling the game, we were getting smashed at the contest and not willing to work hard on transition. The second quarter was slightly better. Our thirst for the contest increased and our overall intensity was up. Our skill execution really let us down though. To the oppositions credit, there pressure was excellent and really hurt us on the rebound. Unfortunately for us, the second half only got worse. We lost our two ruckmen Zak Hawker and Matt Colak to injury and were really stretched by Beaumaris’ big marking forwards. Credit must go to Michael Jakes and Jed Roberts who fought gamely in the back half against quality opposition. Beaumaris were far too good for us today, but we take a lot of lessons out of the game. We were shown the level we need to be at to compete with the best. We must rediscover our mojo and turn things around this week as we make the road trip out to the snake pit to take on a competitive St Bernard’s. Playing for the 1st time in 3 weeks due to the Queen’s birthday then a bye, the Golds enjoyed a strong win over an enthusiastic Beaumaris on a chilly day when Waverley Oval was in terrific condition for playing footy. After an even opening quarter the Golds were able to take a stranglehold on the midfield battle and take charge of the game to outrun and overpower a Beaumaris team who battled hard all day. A barometer for De La is the work rate of not just its running players, but the collective of the team and it was pleasing to note that it was a difficult game to allocate votes, with up to 15 players worthy of votes. Testament to the work rate of the group was that Beaumaris were unable to kick a goal in the second and third quarters while we scored eight of our own before easing to the line in the last when both teams traded goals. Well done to Liam Manakis and Nathan Antonucci who both kicked four, well supported by Mitch Riley, Nick “neon Leon” Leontaritis and Danny Melissinos in the midfield. Next week is a bit of a litmus test to see if we can keep this form going as we take on old foe St. Bernard’s. Playing the top team is always a great opportunity – you can see what you have learnt over the season and you always get better from playing good teams. Our game plan was simple. 18 on 18 at all times, squeeze the ground when they get it and get it in quick when we have it. Interestingly, Hawthorn started with two behind the ball. That’s not something we encourage, however this freed up Jess Weltner to roam across half back. The first half was a super tight contest with the teams only separated by two points at the main break, 1.5 to 1.3. Hard tackling and great support around the ball put Hawthorn off their game a bit and we were full of confidence and ready for them in the second half. Hawthorn took over in the third quarter and kicked two crucial goals. We lost our structure a bit and they had a number of loose players but we were able to score a goal to get it back to five points heading in the last. Hawthorn kicked one early and stretched the lead to 11 points and it would have been easy to just stay in the game and come off smiling that we got close. But we backed ourselves and lifted our game to a new level in the last 10 mins. We kicked two late goals, the last one putting us in front with about a minute to go. Our best players were Sally Fyfield, Carle’ Rooks, Tina Chokbengboun, Claire Clarke, Grace McDonnell, Jess Weltner. Lee Brown in her first game back from injury kicked three (including the sealer) and Sally Fyfield and Claire Clarke were outstanding in the midfield. Grace McDonnell in only her second game was tagged in the second half and Mary Luong and Esther Kim shut down their two best forwards. The song was sung loud and proud. What a day! After no game last week due to La Trobe forfeiting, the Colts were looking forward to playing at home and taking on a dangerous Hampton side who had beaten one of the top sides the previous week. We started well and adapted quickly to the usual slippery conditions when playing at 9.20am. Charlie Bird led the way with his attack on the footy and our forwards were looking dangerous. The second quarter was one of our better quarters for the year due to our pressure, ball use and desire to be less predictable. We went into the main break with a well-deserved 40 point lead. In the second half we maintained our effort across the ground, kicking five goals in each quarter, highlighted by Billy Cooke kicking four in a quarter. It was a game when everyone made a contribution. Joel Caruso and Max Doherty were good down back, Charlie Bird, Cam Roberts, Jordan Gregory were dominant in the midfield and Billy Cooke (6) and Joe Squires (4) were terrific, bagging 10 goals between them. Final Scores: De La Salle 20.12.132 defeated Hampton 6.10.46. With a tough last month on the field and a few losses in a row, the Warriors were in a position they hadn’t found themselves in for a few years but ready for the challenge. We were back at home playing the curtain raiser for the Guns and the support we received from the moment we ran out on the field from the girls was fantastic. It took some time for the first quarter to settle and Monash got a jump on us kicking with the breeze, taking a three goal lead into the first change and exposing us with their zoning off set up. In the second we used the wind to our advantage and although a little inaccurate, clawed our way back into the game with lots of pressure around the contest and a willingness to keep the ball moving forward. We made some adjustments to our set up for the third quarter, namely pushing our forward line up the ground to counteract their press and it paid off – we outscored them kicking into a stiff wind and set up a last quarter effort to hold strong. Monash had their chances early and did not capitalise, with the rest of the last quarter being played with a kick and a half’s difference between us and them on the scoreboard. Having been in a position to come back and win in our last few games but not doing so, it was very satisfying to turn a three goal deficit at quarter time into a hard fought win at the end of the day. No game this week as the Dinos enjoy the view sitting on top of the ladder!